dongchuan lightweight and low-to-the-ground deck structure plus the 200mm oversized polyurethane tires provides the stable smooth ride in the city pumpy side walk and and effortless to kick. 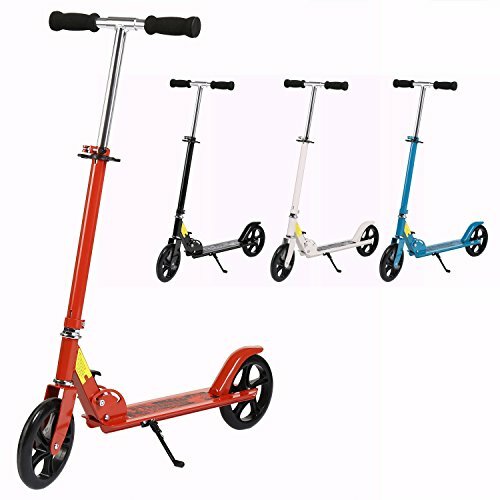 The large wheels scooter is the perfect adult kick scooter designed for a speedy commute or a trip around town. On top of that, the easy-folding mechanism allows you to take the teen scooter anywhere and everywhere. dongchuan is the commuter scooter of choice for professionals looking to cruise to and from work. Parents looking to cruise around with the kids or anyone looking for a smooth and comfortable ride not typical of most kick scooters. Folded Dimensions: 33.5"x 13.6" x 12.2"